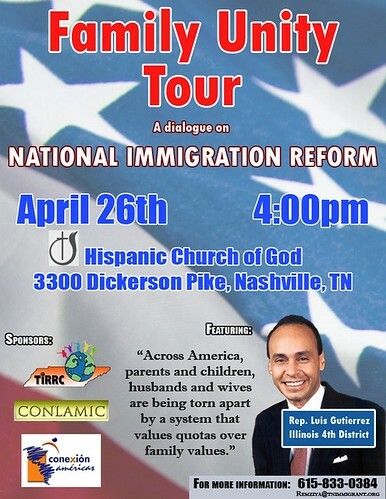 Illinois Congressman Luis Gutierrez will visit Nashville on Sunday, April 26, at 4pm as part of his ever-expanding Family Unity Tour, which consists of "community meetings, prayer vigils and town halls for thousands of U.S. citizens whose families have been or risk being torn apart by a broken immigration system." For details, click on the poster above. Several local residents told their stories of families pushed apart by the immigration laws. Jill Flores, a former ESL teacher at Nationalities Service Center (my employer), talked about her fears for the future as her husband Felix prepares to travel down to Ciudad Juarez to request permission to live in the U.S. with his wife and children. If his request is denied, she will face a terrible choice: her husband or her home. The highlight of the day for me was Rep. Gutiérrez's call to arms. "We have to stop deciding which families are important and which families aren't so important." He ridiculed the government's standard response: "It's fine, we're not breaking up your family--you can just go with him."